In the three-way horse race to prove that biology is not just a terrestrial aberration, there’s one steed that many people ignore: sampling the air of distant planets to see if they contain the exhaust gases of life, or in the jargon of astrobiologists, biosignatures. Everyone knows the other horses: (1) Finding biology in the solar system by hurling rockets to Mars or some of the moons of Jupiter or Saturn, and (2) expanding our SETI experiments to eavesdrop on radio or laser signals from clever beings on distant worlds. The former has the advantage that, if microbes have sprung up elsewhere in the solar system, we might be able to bring them back, dead or alive. We’d have aliens on Earth, an idea that would electrify astrobiologists. The latter horse – SETI – endeavors to discover the most interesting variety of extraterrestrial, namely those that are technically advanced. But a difficulty with SETI is that we need to be aiming our telescopes in the direction of signals while they wash over our planet, neither before nor after. There’s a synchronicity problem. Bugle call, and the third horse – a contender not hobbled by the inconvenience of synchronicity. Consider: the Earth’s atmosphere is roughly 21 percent oxygen, a consequence of billions of years of photosynthetic activity. Oxygen is an exhaust gas of greenery. You can blame the rusted out-body of that clunker in your driveway on plants. The neat thing about this is that the oxygen signature in Earth’s air has been present for roughly two billion years. For all that time, oxygen has been broadcasting its existence into space. It could be easily detected by any advanced extraterrestrials with enlightened astronomy budgets, even from vast distances. There’s no synchronicity problem, because this signal lasts for eons. That’s nag number three’s tempting appeal, and Daniel Angerhausen, a researcher at NASA’s Goddard Spaceflight Center, is betting on it. He’s used telescopes on the ground, in the air, and in orbit to look for the spectral signatures of not just oxygen, but other biology “tells,” such as methane. The obvious way to do this would be to just train a telescope on an exoplanet – a planet around another star – and analyze the reflected light. That approach is dead obvious but extremely difficult, given that precious few such worlds can be directly imaged with today’s instruments. Angerhausen’s scheme is to observe exoplanets that regularly pass in front of their home suns. When they do, they cause a slight dimming of the starlight. This is, of course, the technique wielded by NASA’s Kepler telescope to uncover thousands of (still-invisible) worlds. Kepler senses mini-eclipses taking place many hundreds of light-years away. Angerhausen’s trick is to subtract the spectrum – the rainbow spread of light – from a star when a planet is not passing in front or behind it, from spectra taken when it is. Think about it: Most of the time what your telescope sees is a combination of both starshine and light reflected off the planet. But when the planet is silhouetted in front or hidden behind the star, you only see the starshine. Taking the difference removes the contribution of the star, and leaves you with the spectrum of the planet’s atmosphere. This is easier to describe than to do, and for all the usual reasons. Stars are bright and planets are dim, so the measurement is maddeningly difficult. 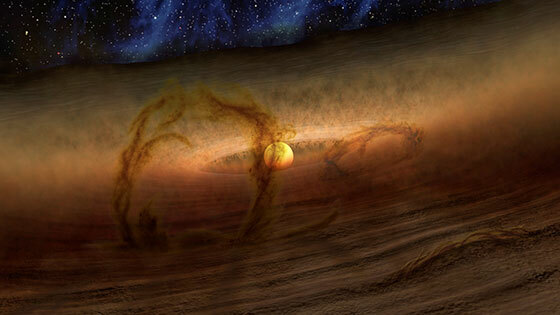 Using a space-borne telescope avoids problems introduced by Earth’s churning atmosphere. But telescopes in orbit are generally small, and whatever instruments are on-board are the instruments you’re stuck with. So Angerhausen has tried another possibility – SOFIA, a cleverly acronymed telescope with a 2.7 meter mirror that rides around in a Boeing 747. Cruising through the night at high altitude, this instrument is above 90 percent of Earth’s pesky atmosphere. And when it lands, there’s ample opportunity to change out the instrumentation or make other improvements. Still, no joy. No clues to alien biology. So let’s tell it like it is: The biggest telescopes are neither in space nor the stratosphere. They’re on mountain tops, and Angerhausen has tried them. He’s not yet found biology-produced gases in a distant planet’s air with these glassy behemoths, but he has reason to remain sanguine about the chances. He’s counting on the relentless improvement in telescope technology – a trend that can be safely assumed for decades into the future, unless you’re a fan of imminent Armageddon. So what would it mean if he found, say, oxygen and methane together in some other world’s atmosphere? Sure, you’d have to check carefully to make sure the gases were truly biogenic. And even then, they might only say that there’s chlorophyll or its alien opposite number on that planet: in other words, the extraterrestrials might be no more than salad ingredients. But if other worlds can spawn lettuce or maybe just algae, there’s at least some chance that they could also grow something a little more interesting. Horse number three may be the race card’s least-known contender, but it has a shot.